If you are a teacher or parent you are now able to move one or more of your students to another teacher or parent. It can be useful if eg. a student has started using Helpfulgames at home and then should use it at school. Then the parent can transfer the child to the teacher and the child will retain all collected medals and knowledge points. It is also useful when a teacher gets a new set of students and want to transfer her old student to their new teacher. 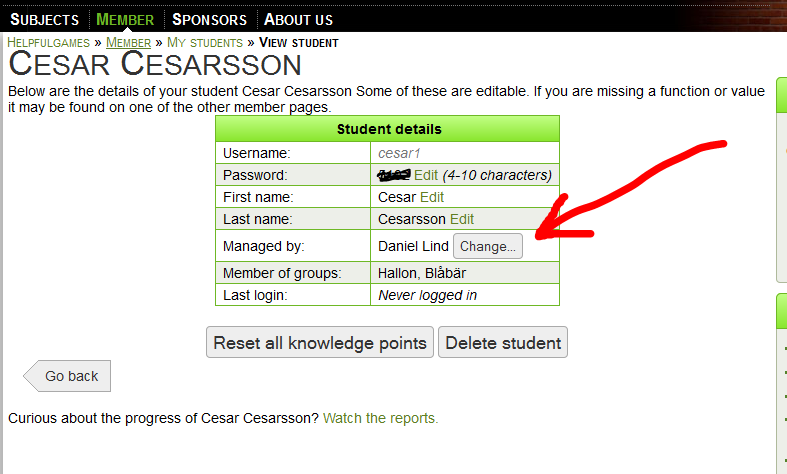 You can find this feature when you log in and click on My students. 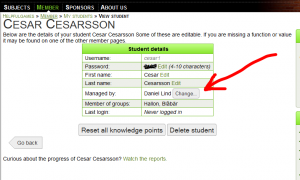 There, click on the name of one of your students. Then there is a button Change... where you enter an email address to which we will send a request to take ownership of the student. When you do this, an e-mail will be sent to the new teacher and if the teacher accepts taking ownership of that student, she only need to click on the link in the email. Then she will be responsible for that student on Helpfulgames.